Heritage-listed James Cook landing site with obelisk in background. First contact with the Aborigines and Captain Cook at Silver Beach. The people living to the south of Botany Bay to Nowra were of the Dharawal language group. The people moving through and living in the Kurnell area were the northern most clan of the Dharawal speakers, the Gweagal. On the northern headland the people were most likely Cadigal people of the Darug language group. The people living on the headlands and shores at the entrance to Botany Bay benefited from the many food and other resources and the mild climate of the area. On both shorelines are many midden sites providing evidence of the rich variety of seafoods enjoyed by the Indigenous people. Many of the local plants were edible such as the roots of the common fern and warrigal, a spinach-like leafy plant that grew along the local fresh water streams on both northern and southern headlands. Because of its bountiful resources, the north and south headlands of Botany Bay were important ceremonial gathering places for the Dharawal on the south of Botany Bay and the Darug on the northern shores. Captain Cook on Silver Beach, 1770. On 29 April 1770, whilst navigating his way up the East Coast of Australia on Endeavour, Captain James Cook and crew made their first landing on the continent, on this beach, and made contact of a hostile nature with the Gweagal Aborigines. Royal Navy officer Isaac Smith became the first European to set foot on eastern Australian soil, with Cook telling him "Jump out, Isaac" as the ship's boat touched the shore at the beach. In traditional Aboriginal culture it is customary for visitors to wait to be invited to approach the custodians of that area so when Cook and his men landed, the local people attempted to discourage the strangers from entering land: two warriors painted in ceremonial ochre threatened the British with spears to which Cook ordered either one or two muskets fired. As Cook and his party landed, a spear was thrown by one of the warriors before they retreated and commenced to ignore the intruders for the entire time the British were anchored in the bay. This is consistent with the customary right of country owners to demand to meet visitors on their own terms. 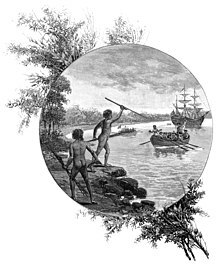 It is now understood that Cook's audacious arrival and landing on Dharawal land was a severe breach of Indigenous etiquette, and an insult to the traditional owners of the land at Kurnell. Ten days after they came across an extensive but shallow inlet, Cook bestowed the name "Sting-Ray Harbour" to the inlet after the many such creatures found there; this was later changed to "Botanist Bay" and finally Botany Bay after the unique specimens retrieved by the botanists Joseph Banks, Daniel Solander and Herman Spöring, who were so impressed by the volume of flora and fauna hitherto unknown to European science. This first landing site was later to be promoted (particularly by Joseph Banks) as a suitable candidate for situating a settlement and British colonial outpost, with Cook reporting back to England that the land was suitable for agriculture and was lightly wooded. However, almost 18 years later, when Captain Arthur Phillip and the First Fleet arrived in early 1788 to establish an outpost and penal colony, they found that the Bay and surrounds did not live up to the promising picture that had been painted, as the area had poor soil, no secure anchorage, no adequate supply of fresh water, and the vegetation was too dense. From the 1820s Captain Cook's Landing Place was a popular destination for people with an interest in European history in Australia. In 1870 NSW treasurer Thomas Holt erected Cook's Obelisk to mark the European arrival at Botany Bay. To cope with the area's increasing visitation Holt built the first wharf at Kurnell just adjacent to the Obelisk and a steam ferry began to operate some time around 1882. Cook's Obelisk, as well as some other collection sites, was added to the Australian National Heritage List on 10 September 2017. A view of the sandy beach. Backed by 2 km of beachfront houses and crossed by the 1 km jetty for the Kurnell Refinery, the beach is outstretched to the west where it has partly enclosed the mangrove-lined shores of Quibray Bay. Its rock wall groynes were established in 1969-70 in reaction to stark beach erosion which was accumulated on the eastern end. The 100-200 m wide western end of the spit is a 1 km long beachfront reserve, fronted by four of the groynes with a boat ramp held against the fourth groyne. Silver Beach is a popular swimming spot in Sydney, with a netted swimming area at the centre of the beach's strip – Though swimming is permitted outside of the netted area, from the beach's western point to the tidal pool at the west just near Cook's landing site. Fishing is permitted, with bream, trevally and flathead being the most predominant in the bay. There exists modern and historic monuments along the Burrawang Walk, which can be entered from the east end of Silver Beach (just past the pier), a couple of bushland trails through the park, picnic areas, whale watching and Cape Solander Trail that winds all the way to Greenhills Beach. On the western end, there is a dog park, which is also a beach area for dogs. The beach is situated on the corner of Dampier Street and Prince Charles Parade, on the south coast of Botany Bay and is accessible from Captain Cook Drive via Princes Highway from the west. There’s a large carpark at Bonna Point Reserve adjacent to the boat ramp, as well as along the length of Prince Charles Parade. There are bus stops on the Parade. ^ "Towra Point Keeping Place". New South Wales State Heritage Register. Office of Environment and Heritage. Retrieved 3 August 2018. ^ Merv Ryan cited in Andersen, Sue; Hamilton, Mary Ann (2006). Kamay Botany Bay Oral History. ^ KURNELL, kurnell.com About AUSTRALIA,. "AUSTRALIA - KURNELL, Birthplace of the Modern Australian Nation, Captain's Cook's Landing Place .au". www.kurnell.com. Retrieved 2018-01-13. ^ Cook, James; Hawkesworth, John (1773). "Entrance of Endeavour River in New South Wales. Botany Bay in New South Wales" (Map). David Rumsey Historical Map Collection. State Library of Queensland. Retrieved 7 September 2012. ^ Nugent, Maria (2005). A Contextual History of Botany Bay. ^ Aunty Beryl Timbery cited in Andersen, Sue; Hamilton, Mary Ann (2006). Kamay Botany Bay Oral History. ^ a b "Cook's Journal: Daily Entries, 6 May 1770". Retrieved 26 November 2012. ^ "Kurnell - A Pictorial History". www.ssec.org.au. Retrieved 2018-01-13. ^ "Cook's Journal: Daily Entries 29 April 1770". ^ "Kamay Botany Bay National Park (North and South) and Towra Point Nature Reserve". New South Wales State Heritage Register. Office of Environment and Heritage. H01918. Retrieved 2 June 2018. ^ "Kamay Botany Bay: botanical collection sites, Captain Cook Dr, Kurnell, NSW, Australia (Place ID 106162)". Australian Heritage Database. Department of the Environment. Retrieved 4 October 2017. This page was last edited on 16 February 2019, at 03:21 (UTC).